1. Preheat oven to 375 degrees (F). Clean and cut mushrooms in half, and coat with olive oil. Season with salt, pepper and thyme. Roast for 15-20 minutes or until golden brown. Remove from oven and allow to cool. 2. Cut the pear and zucchini. Place into an airtight container, and mix with the vinegars, salt and sugar. Put in the fridge and allow to pickle for twenty minutes. 4. In a food processor, process the beans and tofu until a chunky hummus-like paste forms. Scoop out and into a large bowl. Add the minced garlic, thyme, worcestershire, balsamic, salt and pepper and mix. 5. Dump the cooled mushrooms into the processor and process until chopped into a medium dice (uniformity is not important here). Add to the bowl and fold in along with the carrots, almonds and rice and/or breadcrumbs. Set aside. 6. In a medium saucepan, heat oil (I used canola), about a cup, over medium heat. Once heated, add the shallots (rings separated) and fry until lightly browned. Quickly remove and cool on a paper towel. 7. In another pan, heat olive oil over medium high heat and cook the burgers, about 3 minutes on each side or until a golden brown crust forms. 8. Once cooked, spread goat cheese onto the bottom half of a sandwich or burger bun. Top with a leaf of bibb lettuce, the burger patty, pickled slaw and frizzled shallots. Enjoy! 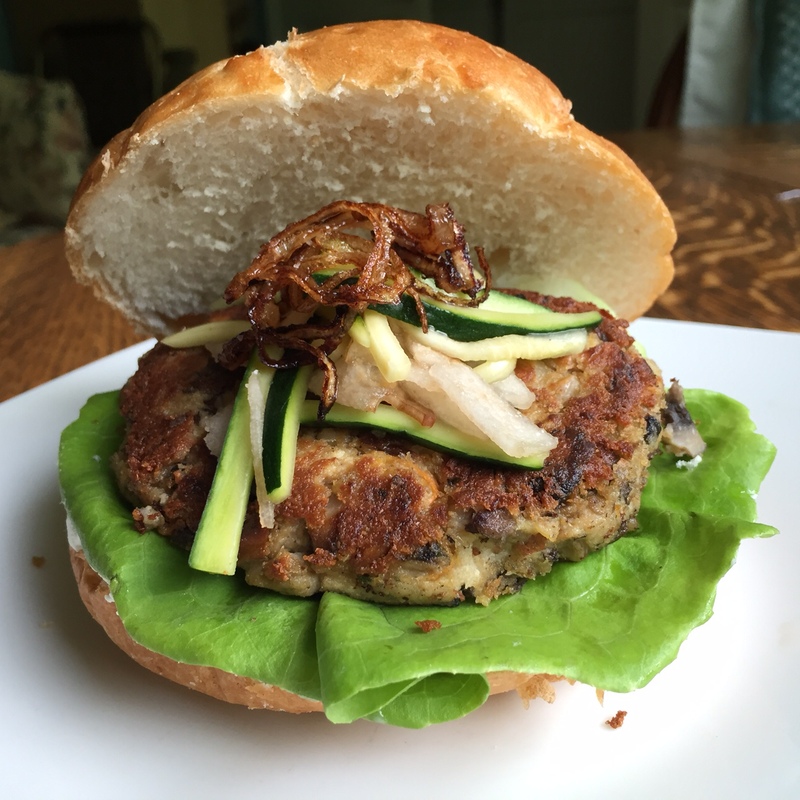 Any veggie/mushroom burger experts out there with any ideas for improvement? Let me know your thoughts in the comments below! I would be remiss as a blogger that advocates healthy eating, to not mention Food Revolution Day, currently underway today! Celebrity chef and British kitchen magician Jamie Oliver has put a petition on Change.org asking the G20 countries to create mandatory food education programs in schools around the world. This is way more than the cookies and cakes we baked in Home EC; children would not only learn where their food comes from, but how to grow and source their own ingredients as well as how to cook healthy sustainable meals. ← Treat Yo’ Self Thursday #15, Cookies? Cookies.